Ivintana is the adopted grandson of his tribe’s matriarch, and the tribe’s storyteller. Ivintana was born pretty much blind and missing his right arm, for which he was deemed a bad omen by his native tribe’s spirit-whisperers. His mother was forced to go abandon him in the rainforest—but just as she was despairing to find a way to save his life without breaking the taboo, she crossed paths with a nomad tribe who agreed to take him in. The tribe’s matriarch raised him as one of her grandsons, and he became the tribe’s storyteller when he came of age. Birth family: both parents alive, one older sister. Of these, only his mother knows he’s alive. Adopted family: around a dozen siblings/cousins. Fantasy tribal setting inspired by Madagascar’s history and folklore. Short, toned body, milky white eyes, missing his right arm. Typical tribal attire (loincloth and lamba shawl), sometimes with a knee-length cloak wrapped around the shoulders. One of my characters about whom I should really finish a story one day. His name means “The small one with good luck” in Malagasy. In familiar settings, people call him either Ikely (“The small one”) or Ivintana (“The lucky one”). 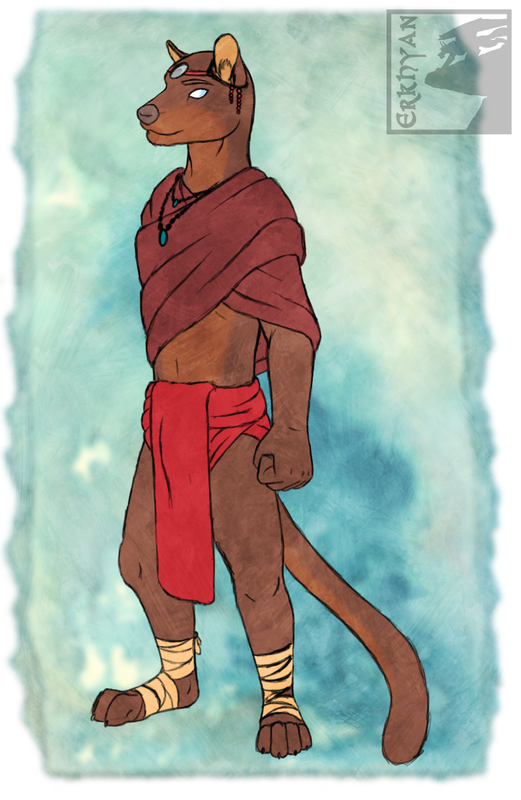 His appearance is based on that of a fossa, his outfit is based on those of the Bara and Sakalava tribes of Western Madagascar. His story is roughly inspired by some still-lingering Malagasy taboos against twins and disabled-at-birth children. wow what an interesting character!